Hi all! 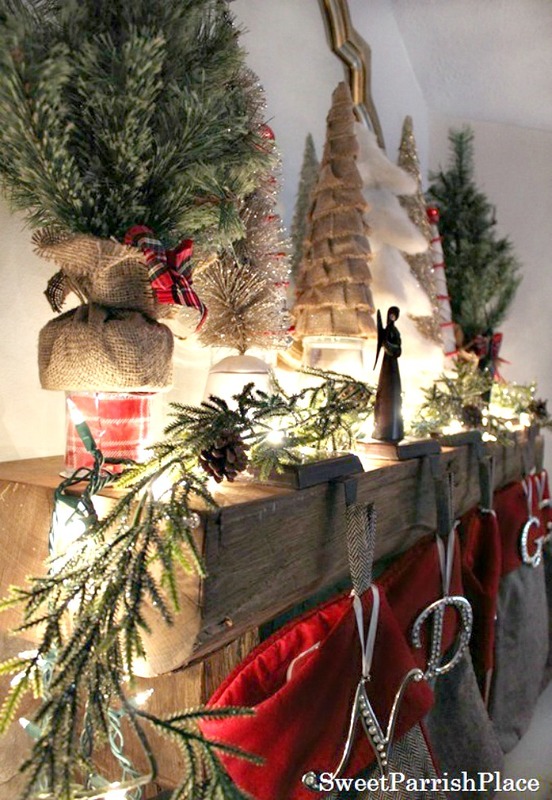 Today I am going to share the second part of my Christmas tour with you today, my Christmas mantle! 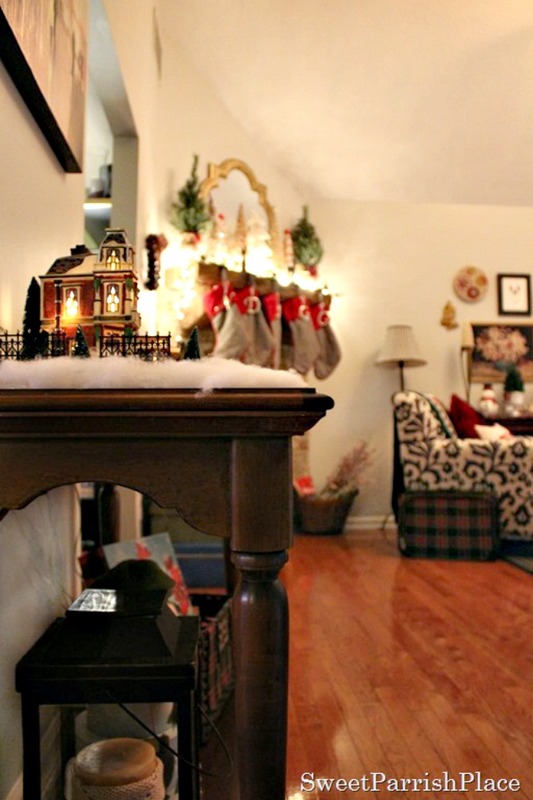 I really love my mantle, and you can read all about how it has evolved since we moved in here. I have to admit, I had a hard time decorating my mantle for Christmas this year. I think I decorated it and then took it all down a few times before I finally got it to look the way it does now. I spent way too much time fretting over it, but I really love the end result, so all is well that ends well! 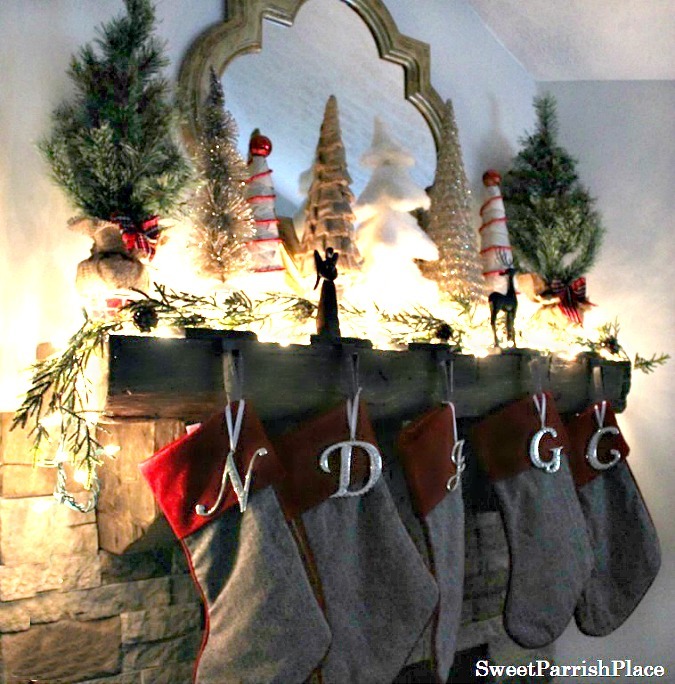 I am calling it my Rustic Woodland Christmas mantle this year because I thought that was fitting. I decided to do a variety of different Christmas Trees, along with some greenery and lights. 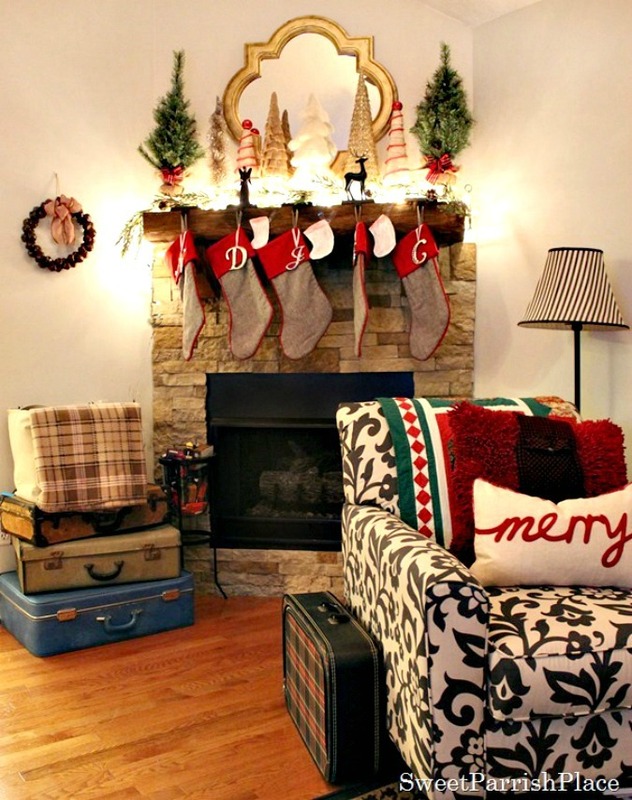 I used lots of plaids and traditional reds in my decor this year. I hope you enjoy it! 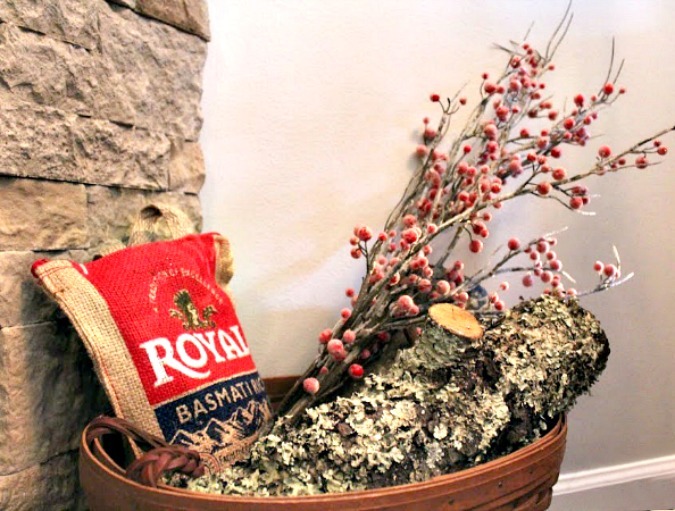 Our fireplace is a gas fireplace, but I picked up a few logs I found (just to make it look more real) to put in this basket along with some berries and a burlap sack filled with Rice that I picked up at the grocery store. All of the vintage suitcases you see pictures were either thrift store or Ebay finds. And the stockings were purchased at Target a couple of years ago. This is the second year we have hung them. I always go to Target on the day after Christmas because their Christmas decor is marked down to 50% off, and they have some real steals! 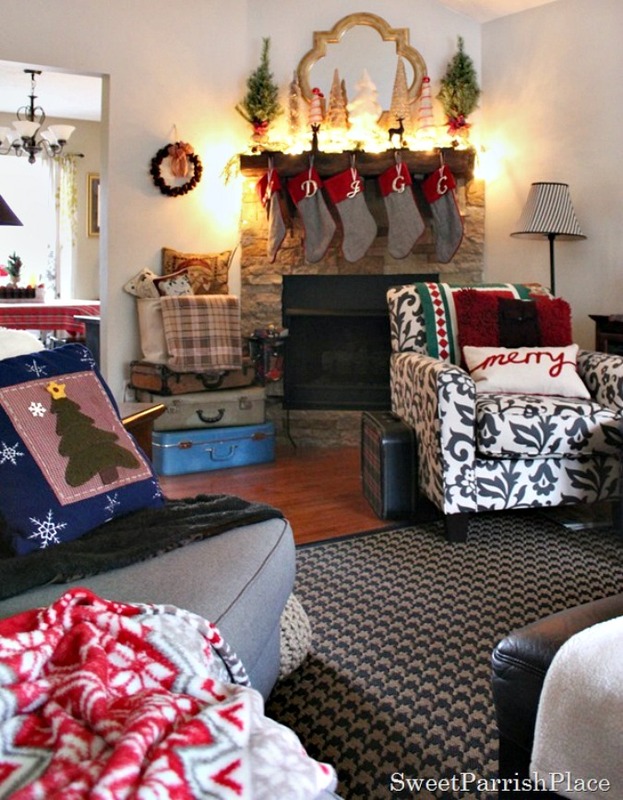 It took three years of living in this house for me to finally have my mantle the way I pictured it from the beginning, and I just love to decorate it for the different seasons! 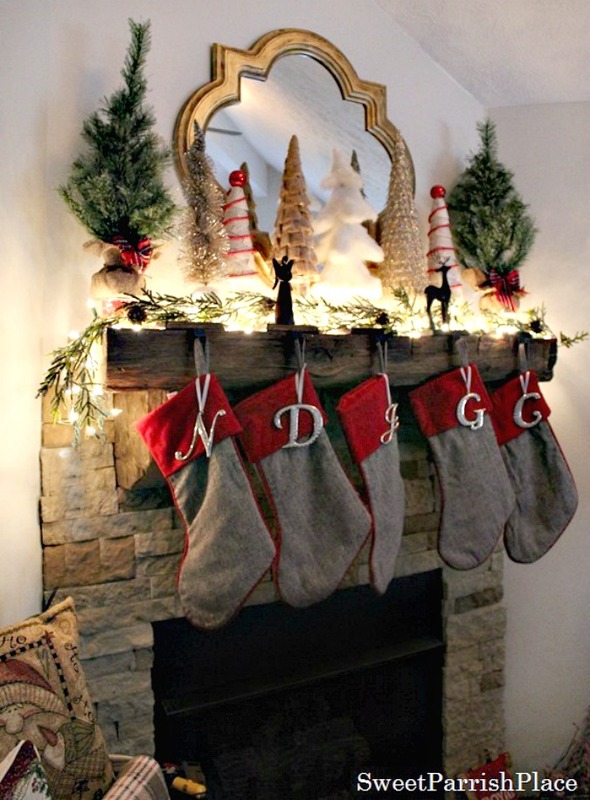 The actual mantel is a real old barn beam, and you can read about how we installed it here. It weighs over 100 pounds! 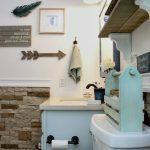 It just hit me as I was editing these pictures for this post that I should have actually turned the fireplace on, and I am kicking myself for not doing so! 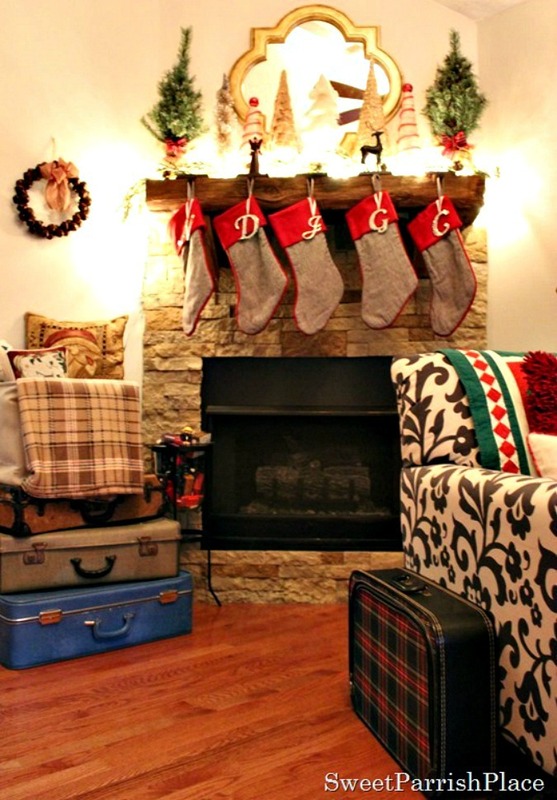 I will try to include a couple of pictures of my mantel with the fire on in another Christmas post soon. If you are a regular reader of my blog, you might notice that I did a little rearranging. We recently purchased a new sofa and chair for our living room, and I was going back and forth with where to place the chair. I moved it up in front of the fireplace, and I am liking it so much better where it is now. You can see where it was before here. 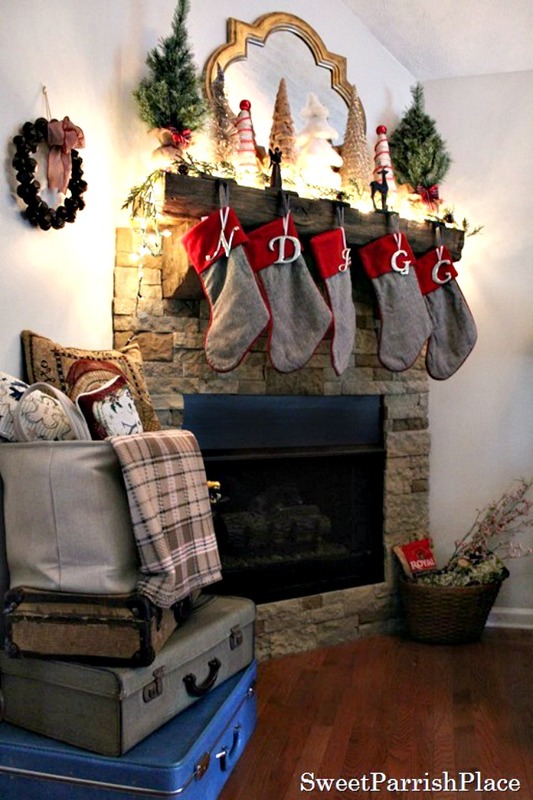 These next few pictures are what my mantle actually looks like. You can see a few small white stockings hung in between the real ones. Mr. 7 Year Old made those and hung them with tape. One is for our Elf, Buddy, and two are for his favorite stuffed animals. I had taken several pictures before I realized they were even up there. So I decided to go ahead and put some of the pictures in anyway because I think it is really sweet, and my little boy loves Christmas, and these moments really are what it’s all about right? Four of these Christmas trees on my mantle were purchased at Big Lots. If you are a regular reader, you might remember I wrote a post about Big Lots Home Decor in the Fall. I also purchased the mirror at Big Lots. The two green trees on either end, the white one in the middle, and the third one from the right were all purchased there just this year. I just tied some plaid bows around the green ones to tie them in with my plaid theme this year. I also purchased the gorgeous greenery you see at Big Lots. It really does look very realistic, and it was less than $10. It has sparkles and pine cones throughout, and I added white lights. 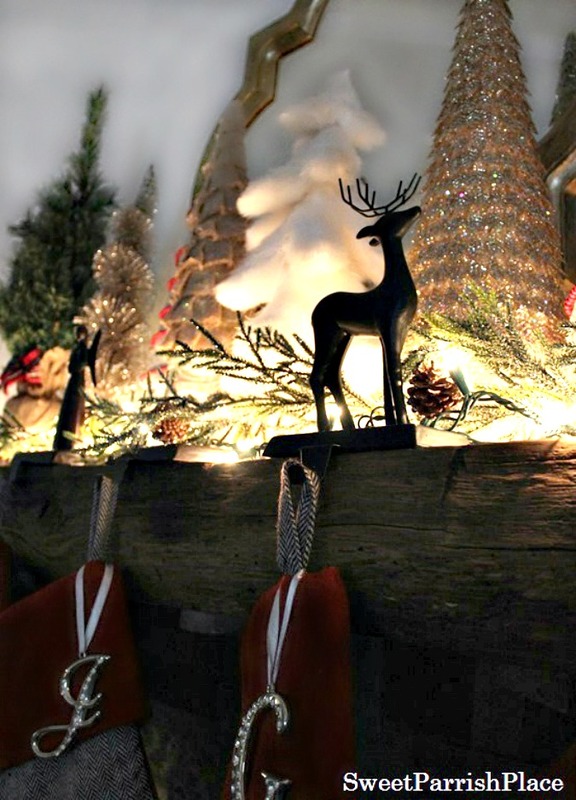 The trees just weren’t looking right to me with the garland and the lights on the mantle. They needed elevated, so I had to get creative. If you look closely you can see that all of the trees except the green ones are placed on top of glass jars from my collection #imajarhoarder. I ran out of jars of the right height that I needed, so I got even more creative with the green trees, and put them up on spools that some of my plaid ribbon came on. I just wrapped a piece of the ribbon around the spools. 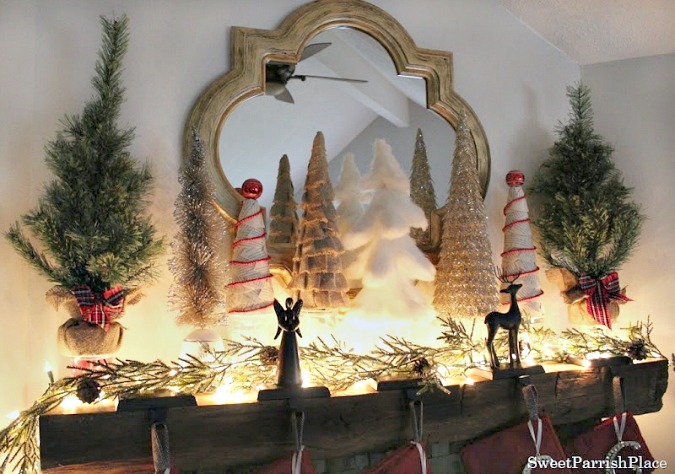 When you are standing down on the floor, you can’t even see the jars or the spools, but the trees looks so much better on the mantle elevated like this. The two book page trees you see were a DIY project a couple of years ago. The burlap tree to the left of the white tree in the middle is from Target One Spot this year. The things they have for Christmas this season are awesome! And every time I stop by they have something new! 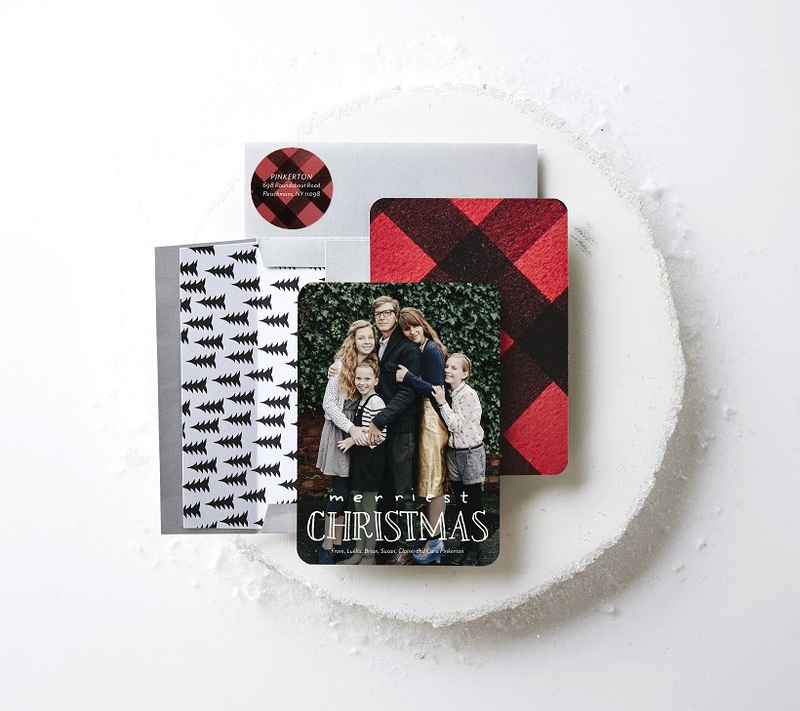 The stocking holders are also from Target. I had to run out and buy one more this year because for some silly reason, one of my stocking holders was missing when I got my stuff down from the attic. So I ran to Target and of course couldn’t find one that matched perfectly, so I settled for the reindeer because it was the same color as the rest. I already had the angel holder. It’s not ideal, but it works. 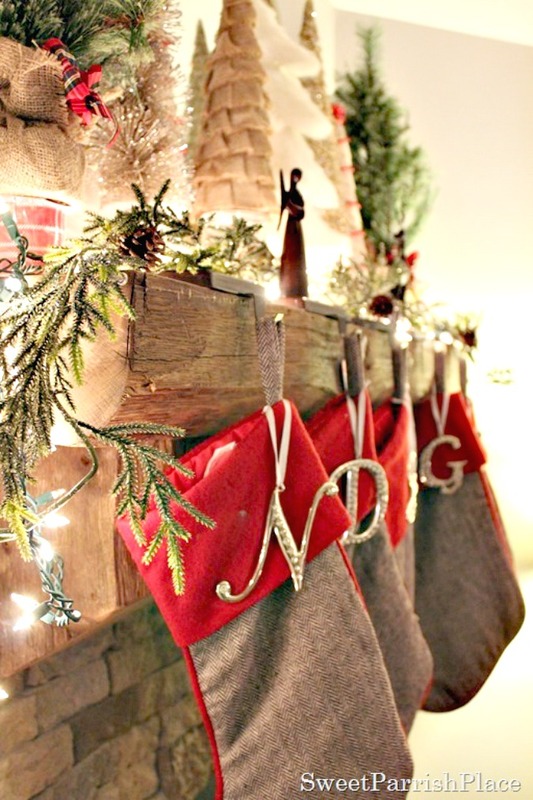 The blingy initials hanging on the stockings were from Kohl’s a few years back. I love the way they look with the masculine tweed stockings. I am very happy with the way my mantle turned out this year, I never want to take it down! Can’t it just stay Christmas all year round? I hope you enjoyed my Christmas mantle this year! 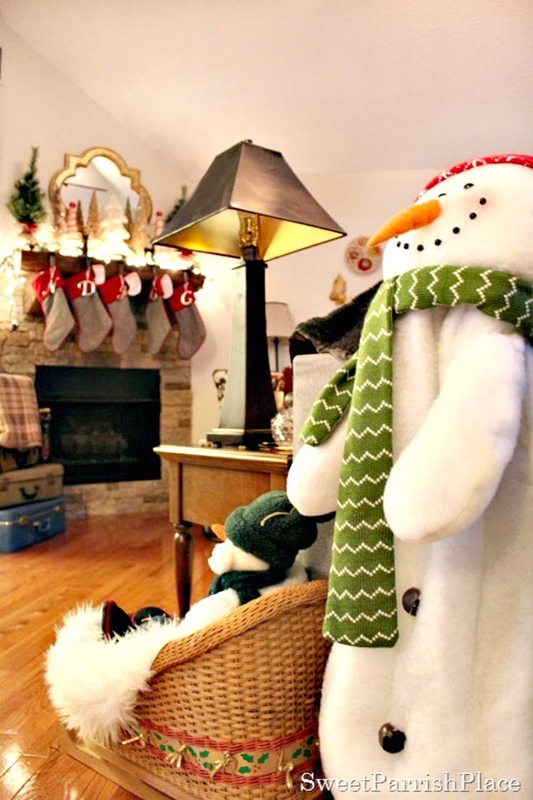 I have so much more Christmas to show you, just as soon as I can get the posts written, and I also have some finishing touches to do in my downstairs family room so that I can share it with you. 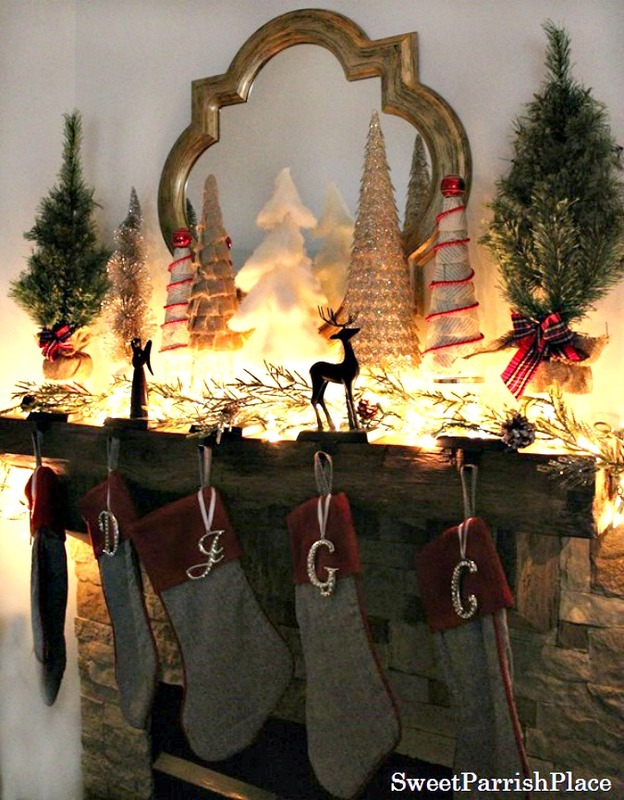 Do you struggle with decorating your mantle at Christmas like I do? Any little tips you might have, please leave them in the comments, I read every single one! Have a great week!